A little known fact is that most homes are built with the minimum required insulation by local building codes. Even new homes don't have an optimal level of insulation. When energy was cheap, home insulation was less of a concern. The older your home, the higher potential for dramatic energy loss exists. As you can see by the map and chart below, the Marion area is in Zone 2. 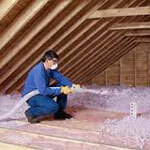 We recommend a minimum of R-38 for the attic to provide appropriate, energy-saving insulation levels for your home. If you have less than 14 inches of insulation in your attic (14"=R-38), it is safe to say you are spending more money on energy than you should. If you don't measure up, contact us for a free quote at 830-305-5156. The measure of resistance to heat flow. Insulation materials have tiny pockets of trapped air. These pockets resist the transfer of heat through material. The ability of insulation to slow the transfer of heat is measured in R-values. The higher the R-value, the better the insulation material's ability to resist the flow of heat through it. Heat flows naturally from a warmer to a cooler space. In winter, heat flow moves directly from heated living spaces to adjacent unheated attics, garages, and basements, or to the outdoors; or indirectly through interior ceilings, walls, and floors -- wherever there is a difference in temperature. During the cooling season, heat flows from outdoors to the house interior. 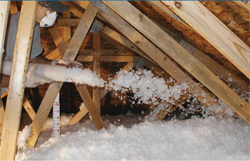 Fiberglass loose-fill insulation is an extremely effective insulating material because its fibers prevent air movement and the resulting heat loss to resist the flow of heat and cold. It is designed for use in attics and hard-to-reach locations such as corners, nooks and crannies. It is installed dry, and because it will not settle over time, maintains its full R-value over the life of the home. Fiberglass loose-fill insulation is fed into a pneumatic blowing machine and blown under high pressure through a long flexible hose into the attics and walls. Although homeowners can rent blowing machines, it is typical practice to have blown-in insulation installed by a professional. Rock wool (or slag wool) loose-fill insulation is similar to fiberglass except that it is spun from blast furnace slag (the layer of impurities that forms on the surface of molten metal) and other rock-like materials instead of molten glass. The production of rock wool uses by-products that would otherwise be put in a landfill. Rock wool insulation is well suited for locations where it is difficult to install other types of insulation, such as irregularly shaped areas, around obstructions (such as plumbing stacks), and in hard-to-reach places. Blown-in loose-fill insulations are particularly useful for retrofit situations because, except for the holes that are sometimes drilled for installations, they are one of the few materials that can be installed without disturbing existing finishes. Rock wool is installed dry, and because it will not settle over time, maintains its full R-value over the life of the home. Properly installed fiber glass batts and rolls do not settle. 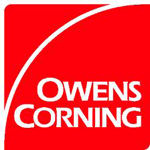 Fiberglass loose-fill insulation will experience negligible settling (less than 2%) over time. When manufacturers’ installation procedures are employed, fiberglass insulation maintains its thermal performance for the life of the building. Cellulose manufacturers agree that their products settle over time. Most set the settling rate at about 20%. Therefore, always consult the “minimum settled thickness” and the “initial installed thickness” listed on the cellulose manufacturer’s coverage chart, which is required by the FTC, to ensure future settling is accounted for. Fiberglass insulation is made from sand and other inorganic materials which are melted and then spun into glass fibers. Fiberglass is naturally noncombustible and remains so for the life of the product. It requires no additional fire-retardant chemical treatments. Unfaced fiberglass insulation is recognized by building code groups as an acceptable fire stop in residential wood frame walls. Cellulose insulation is made of ground-up or shredded newspaper which is naturally combustible. In fact, cellulose insulation is regulated as a recognized fire hazard by the Consumer Product Safety Commission (CPSC). To protect against fire hazards, cellulose insulation is heavily treated with fireretardant chemicals prior to installation. These fire-retardant chemicals can leach out of the cellulose insulation over time. Tests conducted by the California Bureau of Home Furnishings and Thermal Insulation have demonstrated that some cellulose samples failed the standard fire safety test only six months after installation. Additionally, smoldering combustion and re-ignition problems are concerns with cellulose insulation should a fire start. Even properly treated cellulose insulations will burn at about 450°F, the surface temperature of a 75 watt light bulb. Between 1992 and 2008, the fiberglass insulation industry recycled over 18 billion pounds of pre- and post-consumer glass containers, eliminating the need for millions of cubic feet of landfill space. Many fiberglass insulation manufacturers have plants that use up to 40% or more recycled materials in their products. The current industry average is 30% recycled content. Manufacturers are currently exploring ways in which their use of recycled materials can be increased without compromising the performance of their insulation products. Cellulose insulation is generally made up of about 80% recycled newspaper and 20% fire-retardant chemicals. Three times more cellulose material by weight than fiber glass is needed to insulate a typical home. An average 1,200 square foot attic insulated to R-38 with cellulose insulation would introduce 300 pounds of fire-retardant chemicals into the home. Insulation made of fiberglass is not absorbent. 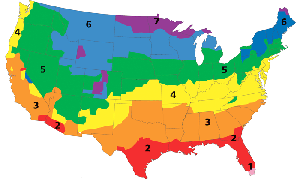 Under normal conditions, all insulation is exposed to humidity in the air. Fiberglass will not wick up and hold water, thus it resists permanent loss of R-value. Because it is inorganic, it is naturally fire resistant. If fiberglass insulation becomes saturated as the result of flooding or other catastrophic events, the manufacturer of the product should be consulted to determine whether the product should be replaced. Cellulose insulation is made of shredded newspaper with an added fire retardant. Two relevant properties of shredded newspaper are as follows: (1) without special treatment it will burn; and (2) it naturally absorbs moisture from the air. This can result in the cellulose insulation losing its added fire retardancy as it ages. Cellulose insulation that is saturated because of a flood or other catastrophic event can lose its fire retardants, and even if it can be dried, it should not be reused without consulting the product’s manufacturer. Fiberglass is inorganic; mold cannot grow in or on it. Cellulose is organic; cellulose itself is a food source for mold. Fiberglass insulation is not corrosive and contains no chemicals that can corrode pipes and wires. Certain chemicals routinely applied as a fire retardant to most cellulose insulation (particularly the sulfates) can cause the corrosion of pipes, wires, and fasteners under some conditions. Being inorganic, fiberglass is bug proof. It will not attract bugs as food source. Being organic, cellulose has to be treated with insecticides which will wear off. Fiberglass insulation is the most thoroughly tested insulation material in use today. The great amount of medical scientific evidence compiled over more than 70 years by industry, government, and independent research organizations supports the conclusion that fiberglass insulation is safe to use when manufacturers’ recommended work practices are followed. Questions about the health and safety aspects of cellulose insulation persist in the building industry because very little medical scientific testing of the products has been conducted. Repeated requests by union and contractor groups that such testing be undertaken have been ignored. Full toxicological testing of dust from cellulose building insulation and indeed dust from pure cellulose fibers as well is needed. Given the high levels of exposure to fibers and dust measured during cellulose installation, only after long-term experiments are available will the safety of cellulose insulation be known. Eco-Touch™ Insulation is the product of choice for energy-efficient and environmentally friendly homes today's homeowners are looking for. Eco-Touch™ Insulation is preferred by 2 out of 3 professional installers over all fiberglass insulation competitors for ease of handling and installation. **Certified by Scientific Certifications Systems to have a minimum of 50 percent recycled glass content with at least 30 percent post-consumer recycled and the balance pre-consumer recycled glass content. ***Unfaced insulation made with a minimum of 99 percent by weight natural materials consisting of minerals and plant-based compounds.